A box came in the post today. Yippee! My Grandt Line windows and doors arrived today from Caboose Hobbies. I'll never forget going there for the first time and marking it off my bucket list. A model train store (no race cars or planes) and they have grocery carts. Not kidding! They have an amazing collection of parts, so I figured I could get what I needed there. They arrived about a week after ordering them. Price was list for Grandt, which is a bit high, but not if you can get them I guess. The box was very heavy duty for just plastic parts, and packed nicely with peanuts and an invoice. No damage on this one, for sure. I bought three sets of doors and two packs of windows which will give me enough to make two small stations and put some spares in the parts cabinet. We can work on the station now! I use my camera as a tool as well as just for taking pictures. This is a reminder of a train show that I picked up at the Train Shoppe. I'll send this to my office to put on my calendar. Here's another one for the Hostler's club, which I belong to. This is a great show, probably the best in Utah. Work time. Not always fun and games here in the shop. I'm about to lay a dozen or more turnouts and I need my belt sander. It is VERY dirty as it has been in the garage near my chop saw. Cleaning time! I was brushing the dust off but there is a ton of it and I don't want it in the shop so Taylor got the vacuum for me and we cleaned it up a bit. This job should have been done outside as I'm generating a fine dust of wood and metal filings. Dust just gets everywhere! I need a vacuum in the shop from now on. After vacuuming I cleaned every inch with 409 spray cleaner and wipes, along with a dusting brush. It is nice and clean now and under the workbench. I need to find the belts and sanding pads and change them out so I can be ready for track laying! Just exactly how do you see hidden track to lay hidden track? Ok, so its not INVISIBLE track, just hidden, and usually under the scenery or benchwork. Now that I've explained that to my daughter, let's put down some rail! Track laying requires a lot of small tools and lots of light. Luckily my layout already has great light, as most of my no-flash layout pictures can attest. Here is my adjust height metal desk for my tools, which has a swing light on it. Plugged up and ready to go. First I put in the turnout. This is just a test fit to mark where I need to put the hole for the Tortoise Switch Machine. Taylor is busy trimming and cutting the rail joiners (code 83) that we'll need to join the track. It didn't last long as Mommy was digging out Christmas decorations and that seemed to be more fun. That and she crushed almost all of my rail joiners, so a trip to the hobby shop tomorrow is mandatory. Got to learn some how. I'm sure I crushed a million of them, too. I marked the ties and the center, and drew a dot where the hole will be. For some reason the Tortoise throw rods are always too short. Like Thayne, I'm going to have to go get some steel wire and make longer ones. No installation tonight, and I need another one anyway. The track gets connected and placed on the roadbed, and I use a small glass mirror to make the alignment adjustments. This is a great trick and the mirrors are like 3 for a buck at the dollar store. It will immediately show in the reflection if the track is out of alignment. Taking my time, sipping a Bourbon and just enjoying some way too early Christmas music while I put down the track. Track laying takes time and if you rush it, you'll be replacing it. All of my connectors are trashed. Thayne had a cool rail joiner spreader that I like over at his house. I had used a piece of rail before but never thought of putting a large handle on it. In the wood box was a large dowel and using a Zona saw and X-acto miter box, I cut about a 6" piece of dowel and drilled a small hole in the end. I took a piece of code 83 rail and sharpened one end with a grinder. Then, using a small hammer, I drove the rail into the handle. Using my belt sander I sanded sharp the ends of the rail segment so that I could put a tight rail joiner over it. I labeled this one "code 83" as I use different rail for different things and may need more of them. Great idea, Thayne! Thanks for letting me steal it! Each rail joiner should be snug, but not so tight you tear up the track putting it on. Often I use Xuron track pliers. If the rail joiner is too loose it may not conduct electricity or could derail a train. Snug is what you want. At the end of the section I was careful to cut the ends level, and to file them smooth (including the web of the rail) using a jeweler's file. All my files are rusty so I'm going to add it to my hobby shop grocery list. Micro Engineering track is known to cause cancer in California. Better you move to Idaho than die. There! Taylor put the test caboose on the track and ran it back and forth. Nice and smooth, but I won't do the final adjustments until later. Right now we are looking just to get it down. Let's start on the second section. Track is a bit of mix and match. So far I've put down Atlas Code 83. I'm going to use some Micro Engineering track as well. Each section is carefully filed and fitted, then nailed to the roadbed. I never nail the track down, but for this hidden track I'm not going to ballast it, and I need a way to keep it down. Since this is low profile I can nail into the plywood so the nail won't back its way out. If you lay track on Homasote, the nails will eventually back out and knock your train off the track. I just realized that during the commotion I left the retairers off the second section. No worries, I'll put them on this one and that still gives me plenty. Wife wants me to turn in, so that's it for tonight. I'll come back and finish the track soon. 061 The Augusta Railway - The Decision is Made! We Hand Lay the Track! I've made up my mind. We're spiking it down by hand! Yeah! All visible track that is. Umm...wait...no...yes, we'll hand lay! Lot's went into the decision. I came across a great article on the internet about the cost of hand laid vs flex track. They cost about the same IF you buy ties and rail. We'll, I have a ton of rail and ties here, so the cost went down dramatically. Also, nothing beats the look of hand laid On30 track. This is a very small layout, so the trackwork won't take long, and some of it can be done off the layout, which is even easier. To me, neither Peco nor Micro Engineering track is quite right. Both are way to precision for a 30" line, and Peco ties are enormous while ME ties are too thin. Hand lay...makes it MY WAY! I'm going to use the method that Glue Bob Wheeler taught me. He's a fantastic track man, and his work is excellent. 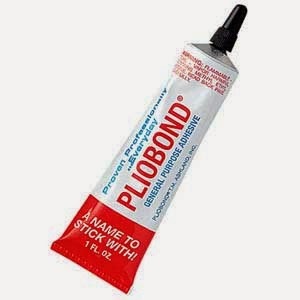 He used Pliobond Cement in the tube so that he can cut a slot in the tube and run a bead of adhesive along the bottom of the rail. Once it dries he hold the rail on the ties in position and heats it with a 175 watt soldering iron which makes the glue pliable like a hot glue, and the rail is affixed in position. Need to adjust? No problem, just heat it back up. I've tried it at Bob's and it works, so that is what we'll do. Laying track should go fast. I can do one turnout in about an hour, so we're only talking a few weeks to get the mainline done. I'll need to make a rail gluing jig, so we'll do that first. It is just a cradle for holding the rail while the glue sets. Thanks Bob! Appreciate the help! Oil is heated to 350 degrees. Turkey is seasoned with cajun spices. Stuffing cooking in the oven. Wine about to be uncorked. Life's good! I love fried turkey. We will be initiating friends to Southern Thanksgiving Cuisine today...and I have a bottle of Tums for them when we're done. The only thing on the menu that is Utah centric are the home made rolls from the Lion House Restaurant...yummy! After dinner and a nap...I'm headed to the train room! I'm thankful for my wife and beautiful daughters, a warm house, and a basement full of trains. My plans for Black Friday....LAYING TRACK!!! 060 The Augusta Railway - More Cork! Let's finish up the roadbed on the hidden staging shall we? Probably going to need some help. I'm not sure if Taylor comes down to help me with the layout, or does it just so she can stay up late. She knows I'll let her stay up because I lose track of time when I'm in the basement. We need more push pins, so I set Taylor on the task of twisting and pulling each pin out of the cork and putting them back in the box. You twist them to break the glue bond and to loosen them from the cork. Otherwise, you can pull the cork off the roadbed. She does a great job. Next we take the very last section and coat it in glue. Enough to cover the surface, but not so much it oozes out from the cork. We worked together cutting cork and aligning it on the roadbed. All done! Both of us have glue all over our hands. The cork is down. Let's get it read for track work! While I went over the cork with a fine grain sanding block, Taylor came up behind me and swept away the dust. We make a great team. She notices a rough spot on the turnout and sanded it down. Wish my eyes worked that good. Now...to on to the track work! 059 The Augusta Railway - The Track Gangs Go To Work! It is amazing how 30 minutes or more a night can make your railroad come to life! One thing I've learned in building layouts is to NOT work just on the layout infrastructure all at one time. I know, you are in a hurry to run trains! Me too. But I've found that if you just work on benchwork, then just work on track, one day you will have to sit down and build 25 structures and they take time. Scenery takes time. Better to alternate your projects and do something different every few days. It makes it more interesting! 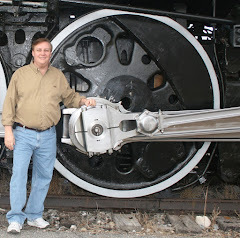 I just got an email from my friend and NMRA Lifer Tom Beutler! He gave me this tip on wiring connectors. http://www.tiewraps.com/specialized_3mttap.html. Up until now I've always soldered my connections, but more and more people have used the "suitcase" connectors with great success. 100 for $15.00 is not bad, so I'll probably give it a try. Thanks for the tip, Tom! Time to put down cork road bed. WHAT!!! NO On30 PURIST USING CORK ROADBED! Calm down, ye purists! I'm a Conspiracy guy! This is for the hidden trackage under the scenery and is only being used to help keep the trains quiet. I'm putting HO track on it anyway, so its not like I'm violating policy. This is a box of HO roadbed from Walther's. We'll start from the left end and work right. The tools we need are a box of push pins, a very sharp hobby knife, Elmer's Glue-All White Glue and an index finger. Stop laughing. It is a tool. Oh, and a sanding block. I sanded the surface again as the wood I'm using is very prone to splinters. Ask any of my fingers. One good thing about using Sharpee markers is that you can sand the surface and still see the marks because they soak into the wood. Unfortunately, unlike a pencil, they do NOT come off, as the X indicates. A bead of white glue is laid down one side of the centerline and I spread it out with my finger. An old blue towel is draped over my shoulder for any mess I need to wipe up. Just ask Glue Bob while I keep towels around! Breaking a strip of roadbed into the two sections, I take on section and put the non-angled side on the centerline and push it into the glue. Once it is straight, I use a few push pins to keep it in place. Note that push pins don't like to go into plywood, so you have to push really hard. There is a turnout here so I take the cork and go down the right hand side of the siding. ...and using the hobby knife, cut it into two equal lengths. You can see here where I off set the cork by gluing the shorter piece in place. This offset allows for a better transition on the track. The next full length piece goes on the outside of the turnout and in line with the centerline. I'm careful to flatten the cork out into the glue. Usually I use a wallpaper roller to smooth and level the cork, but for some reason I can't find mine around here. Putting on cork on the other side gives me the mainline. More cork gives me the siding. I just take my time and make sure the cork is very flat and firmly glued in place. The pins will hold it for 24 hours as the glue totally dries. Glue does dry faster, but cork prevents air exposure so I give it plenty of time. Next is the middle section. Very easy here, just straight pieces. I glued each of the four pieces into place and pinned them down. Then I chopped of the remnants that would overhang the edge of the section. Easily done. Laying cork is fun and very quick...until you run out of push pins. Where did all my push pins go? I asked the wife and raided her desk, but only got a few more. This will be a nice and quiet piece of hidden track. The sidings are about 8 feet and 6 feet long. More than enough to hold four small On30 trains. After scraping up a few more pins I decided to add one more straight length of cork to the third section. If I lay the cork from the left to the right, the cork will stop just past the turnout points. This makes for a week and bumpy area around a critical (and hidden) turnout. We don't want that. So I'll start the cork from the right. Yes, this is better. It will pass completely through the turnout with room to spare. The last cork I can put down is on the ground. I can't do more without push pins so I'll just wait until tomorrow and finish the chore. Wile I normally clean up, tonight I'll just leave the tools for a quick finish tomorrow when I can pull out the other push pins and re-use them. 1. Never let the ends of two pieces of cork meet together as it can cause a bump. Always stagger the ends. 2. Always use Elmer's Glue All or the equivalent and DON'T use Elmer's School Glue which is water soluble and will release if it gets wet with scenery water. 3. Sand the roadbed before gluing the cork for a good, tight bond. On30 in Utah - Time for a Conspiracy!